In this section, you can customize the task information and card appearance. Select a field displayed as Task title. You can add any list field to display it on board (for example, Project name). 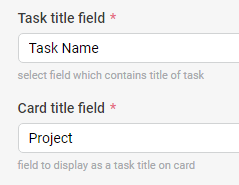 In this example, the Task title field of item and Card title field chosen for displaying on task body have the same list field. In this example, the Task title field of item is an actual task name. 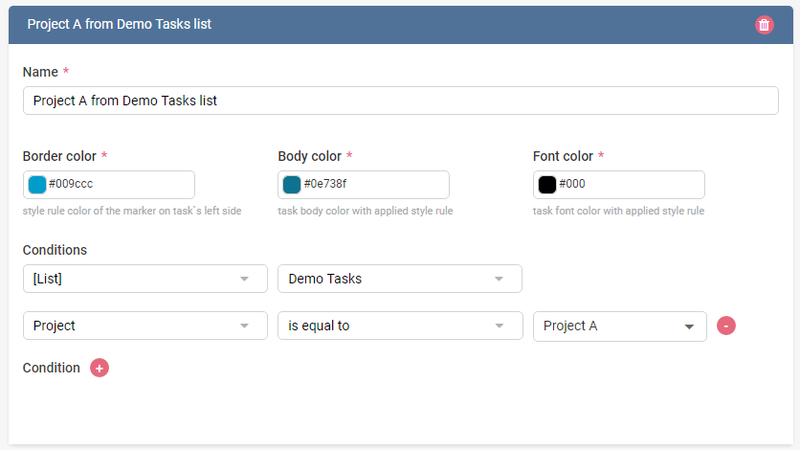 And the Card title field for displaying on task body contains the value from the column “Project” (the custom column added to current Content Type). You should select field containing users assigned to a task. You can apply user notification feature. If you tick this box, users will receive email notification when they are assigned to a task. You can highlight overdue tasks on your board. Select Due Date field of task and tick the box to add a color marker to the task body informing this task is overdue. It is possible to select a custom color for this marker. This style rule has priority to other style rules and overdue task marker will be shown instead of other custom style rules. You can select Small, Medium, or Large task size to match the board design. 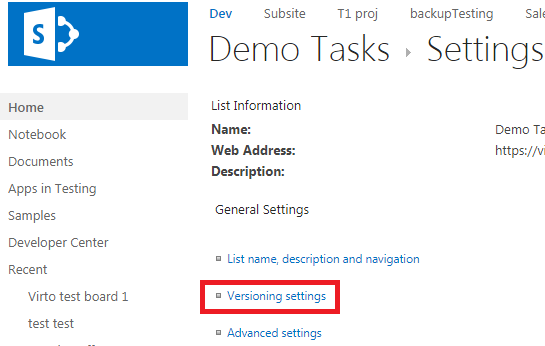 Next setting allows you to define the set of fields displayed on task body. You can select certain fields to display for each list. Note: if the checkbox “Add color marker for overdue tasks” is enabled, the task’s due date will be displayed on the card. Note: Rich text and multiple lines fields are not supported on the card view, you can display them in the tooltip. There you can select fields, which will be shown in task pop-up window. 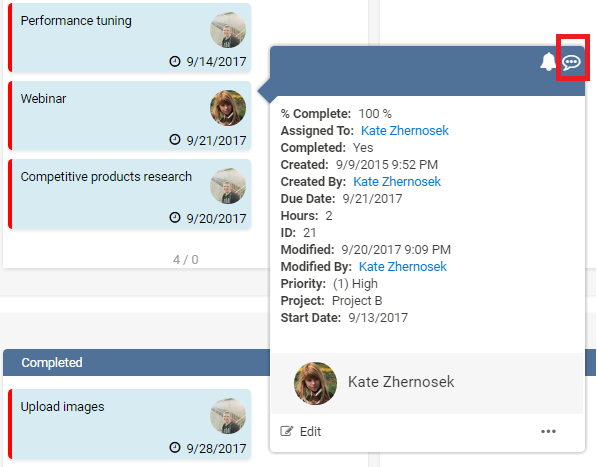 You can add comments to your tasks. When you create a quick board and a new list is created, it has the “KanbanComments” field by default. In other case, you have to add this comments column to your list manually. 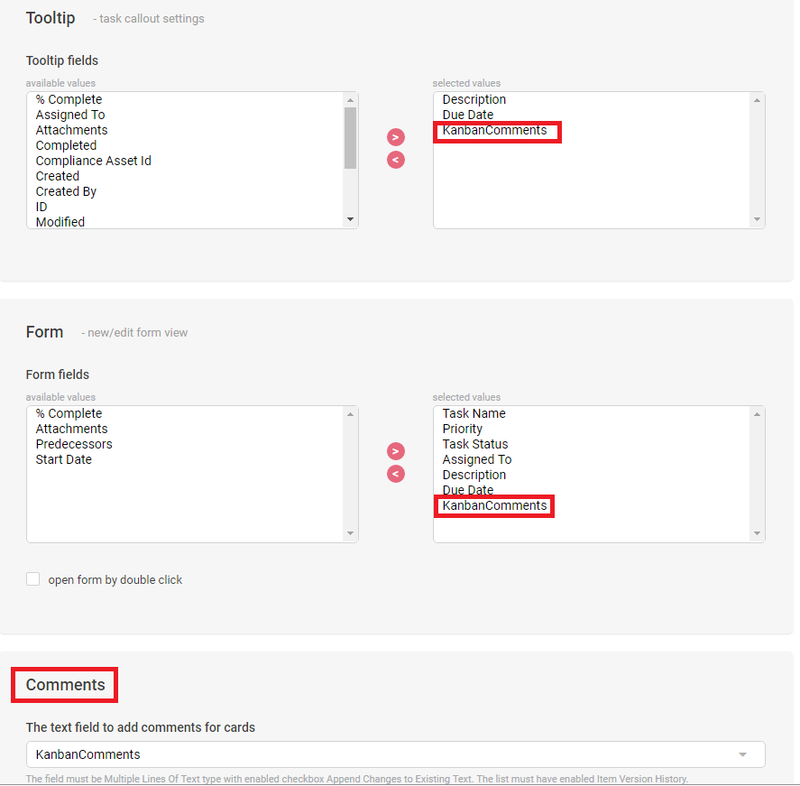 Before you select a field for comments, you have to create a custom Multiple Lines Of Text type column added to the selected content type of your Kanban list. The column must have enabled checkbox “Append Changes to Existing Text”. 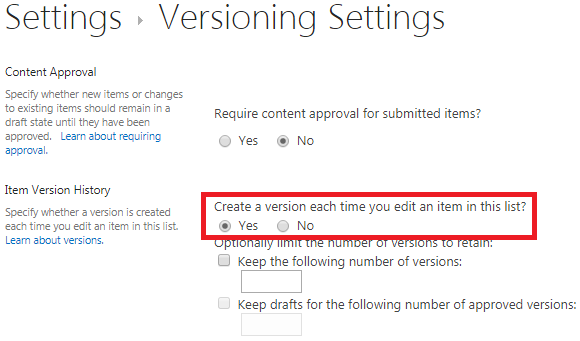 You must have Item Version History in the list versioning settings enabled. Now, you can select the field for comments in “Cards Setup” tab of Kanban Board and add it to Tooltip and Form. 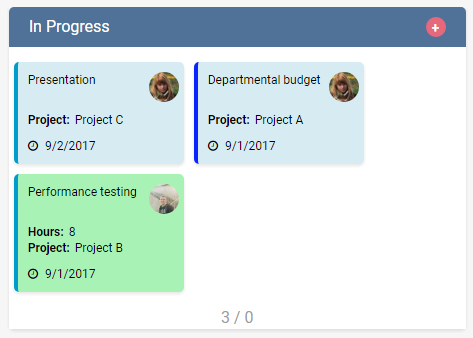 In the following example, a custom column “KanbanComments” was added in Kanban settings. 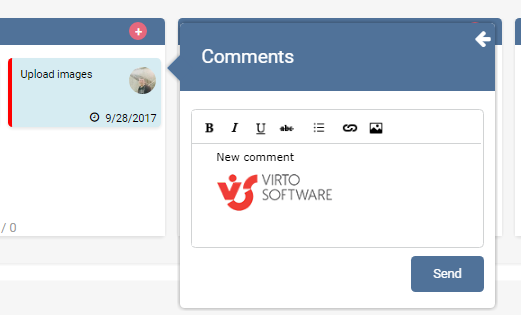 Now, comments are available from the task tooltip. You can adjust the create/edit task form and choose list fields to display in this form. The checkbox allows you to set action: open form by double click on the task. 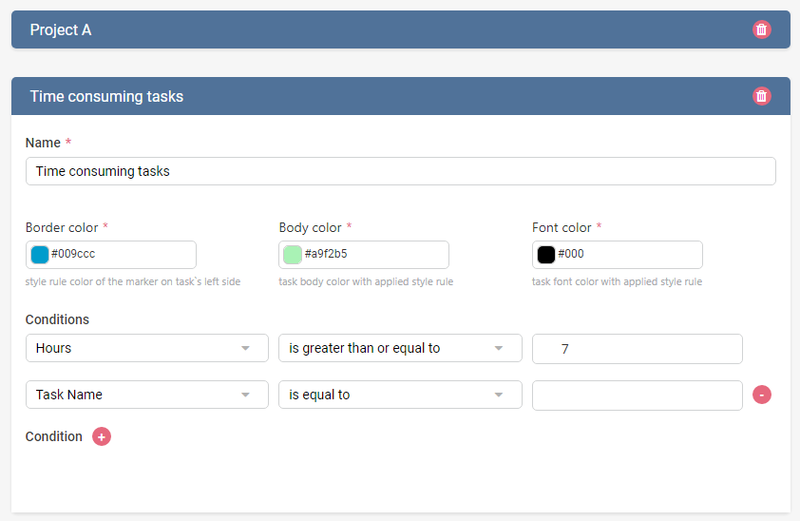 You can specify task card colors: body color, border color, and font color. 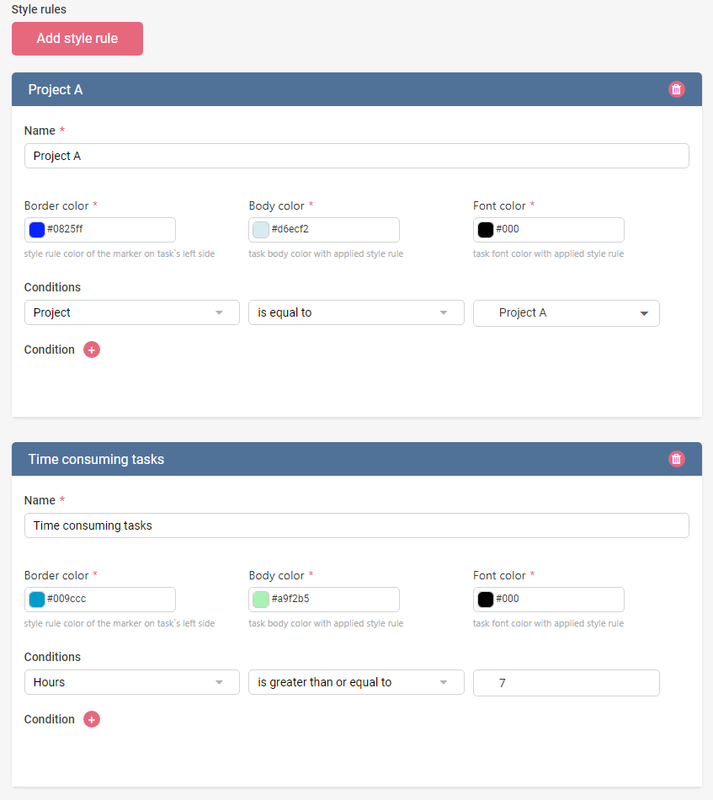 You can set custom conditions and color-code tasks according to a condition rule. To create a condition, click "Add style rule". 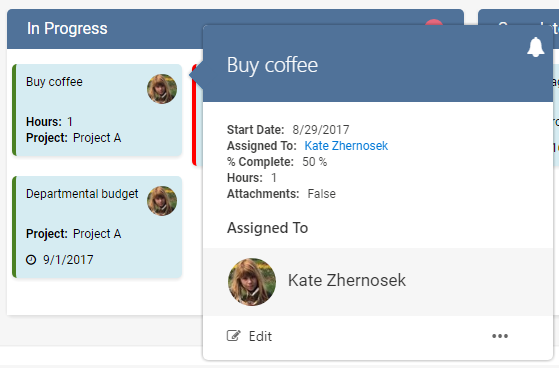 In the first example, the deep blue border marker is applied to all tasks from “Project A”. In the second example, the green color marker is applied to body color of all tasks lasting longer than 7 hours. If the condition is true for a task, it will look like on the example below. You can create another condition by clicking on "+" or delete condition by clicking "-". 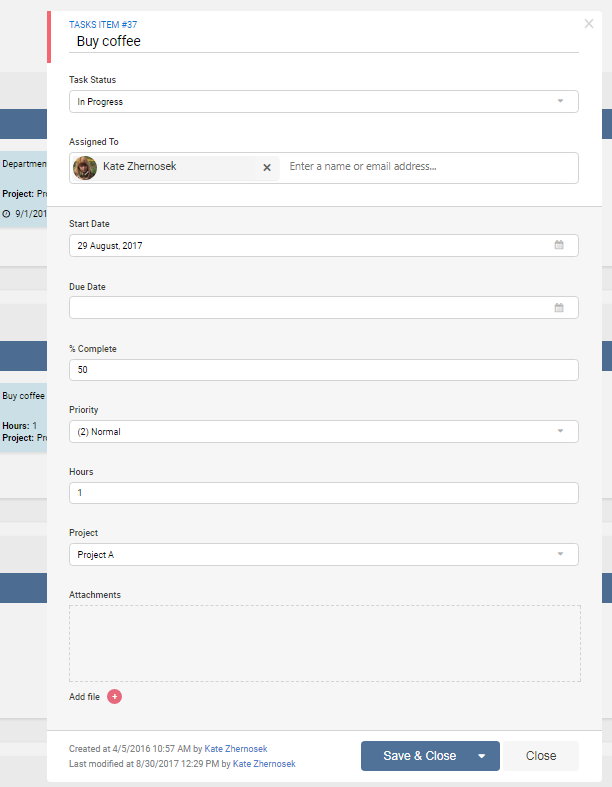 If you have selected several lists to be displayed on this board, you can apply the list filter and create a precise condition for a particular list. Note: if you create several style rules and a task matches more than one rule, only the first rule will be used. Note: you can use drag and drop feature to place one of the created rules above the other rules and make this first rule prioritized.